Unlike some of other Arkansas hauntings, the Gurdon ghost light is a present phenomenon and not something that's only been seen in the past. It's been seen on television, photographed by tourists and generally accepted as existing. Unsolved Mysteries even came to town to document it in 1994. The mystery isn't whether it exists or not. The mystery is what exactly the light is. The local people tell a legend to explain the light, but Unsolved Mysteries told a different one. A common theme to both legends is that the ghostly apparition is a railway worker. The location is still in use by the railways, and the way the light moves would remind you a railway worker carrying a lantern. One of the legends is historically accurate. In 1931, William McClain, a Missouri-Pacific railroad foreman, fired Louis McBride (or Louie McBryde). McBride then killed McClain. The events leading up to the murder are a bit sketchy. Some sources say the argument was because McBride sabotaged a section of track and caused a derailment. Others say McBride was asking for more hours and McClain wouldn't give them to him. An article from the Southern Standard, an Arkadelphia paper, in 1932 states McBride told the sheriff that he killed McClain because McClain accused him of being the reason that there was a train accident a few days prior. So, this is likely the true legend. Either way, McClain was beaten to death with a railroad spike maul. McBride was later sentenced to death by electrocution and executed on July 8, 1932 (he's listed in the execution records as MCBRYDE, LOUIE). The Gurdon light was actually first documented shortly after he was executed in the 1930s. It's theorized that the light is McClain, haunting the tracks and carrying the same lantern he would have carried for work. The theory the locals toss around is shorter on historical accuracy, but equally interesting. It says that a railroad worker was working outside of the town one night. He accidentally fell into the path of a train and his head was severed from his body. They never found his head. Local people say the light is actually the light from his lantern as he walks the tracks searching for his missing head. It was fairly common for railway workers to be injured or even killed, so it is possible that one was decapitated. This light cannot be seen from the highway. You have to go to it. It's a two and a half mile hike to the place where you can view the mysterious lantern. You will pass by two trestles before it is seen. The spot is marked by a slight incline in the tracks and then a long hill. 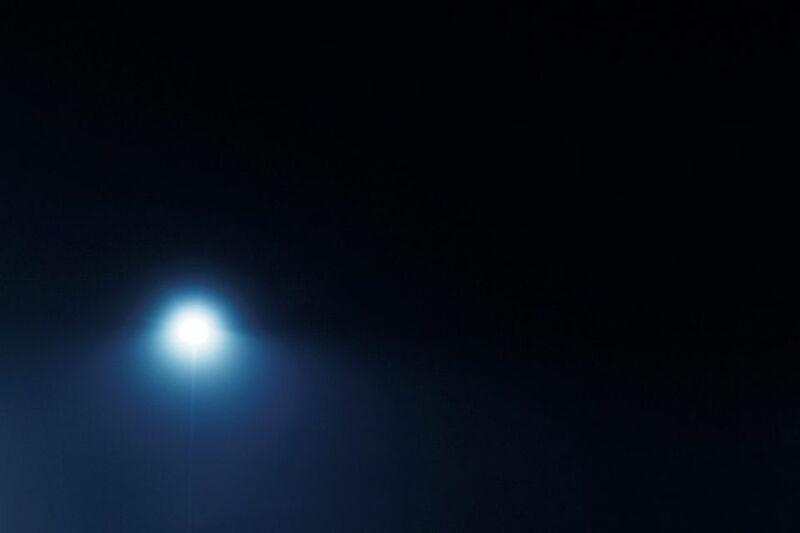 The light is an eerie white-blue light which sometimes appears orangish. The light sways back and forth and moves around on the horizon. The light is frequently seen on the darkest nights and best seen when it is cloudy and overcast. Check out the Roadside America map before you go. Unsolved Mysteries didn't find out what the light really is, neither have any scientists that have checked out the area, but there are a few theories. One leading theory is that it is actually just highway lights reflecting through the trees. Historians, however, disagree. They say the light has been written about and spoken about since before the highway was even there. Scientists have tried to explain the light and concluded it can't be highway lights. The nearest interstate to the tracks is about four miles away, and a large hill stands in between the tracks and the interstate. If the light was caused by passing headlights, it would have to be refracted up and over the hill to be visible on the other side. The article claimed Clingan attempted to gauge the length of time it would take a car to cross the horizon point at a 45-degree angle (the angle of the interstate to the tracks) at 55 miles an hour. Moving at 80 feet per second, he explained, 'the lights would be visible much longer than the second it takes for the Gurdon light to appear and disappear." Clingan also walked close enough to the highway to hear the sounds of specific trucks. He insisted the sounds never coordinated with the appearances of the light. Dr. Charles Leming, professor of physics at Henderson State University, was an authority on the light before his passing. He and his students did many observations of the light. One impressive find was that when the light was viewed through filters, the lights never polarized. Any mirage light would polarize. They also could find no electromagnetic current on a galvanometer, and that the light appears consistently, regardless of atmospheric conditions. There is also a theory that suggests stress on the quartz crystals underneath Gurdon causes them to emit electricity and produce the light. They call this the piezoelectric effect. The theory is that the New Madrid fault, which runs through this area, puts intense pressure on the crystals and squeezes them together causes them to develop a charge and put off a spark. Gurdon, Arkansas is located about 75 miles south of Little Rock on Interstate 30 and is located just east of the Interstate on Highway 67. The light is outside of town and along a stretch of railroad tracks. It takes a couple of hours to reach the location. You can ask for directions in Gurdon. Ask at any gas station. Everyone in this small town knows what you mean (they call it "ghost light bluffs"). There is a similar light with a similar story in Crossett. Crossett has lots of quartz too. This one I've actually seen for myself. It's quite bizarre but I don't think it looks like a lantern. It's a very crisp, clear light that you can see moving around. My friend and I tried to get close enough to it to see what it was, but that is impossible, it keeps moving around and once you get to where it was, it's gone. This a popular spot for kids on Halloween.